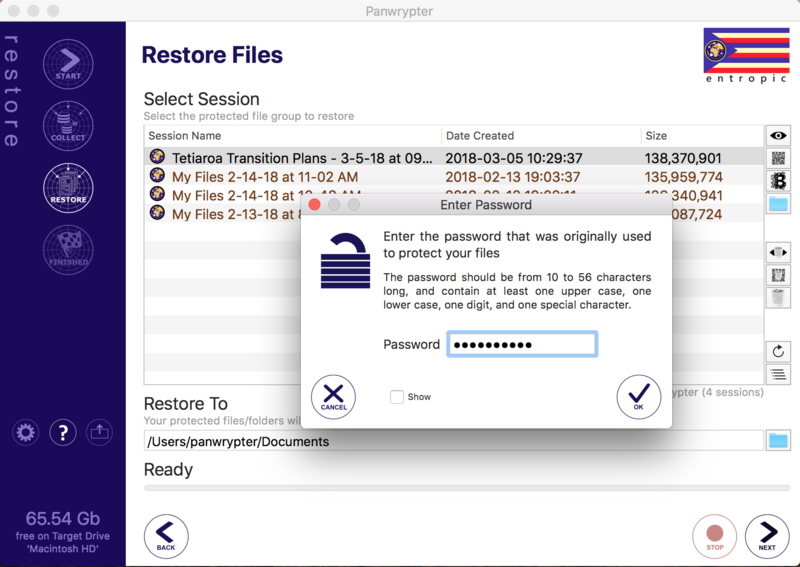 From the introduction screen, select the "Restore Files" option to start scanning clue cards, collecting protected volumes and restoring files. This screen allows you to regroup/collect your protected volumes from various storage media and connected storage sites, back onto your Mac. You may have optionally created and printed a Clue Card when you initially protected your files. The Clue Card contains the session name and site clues for your Panwrypter session, and can help you remember the location of your storage sites, and protected volumes at a later time, if you cannot recall them. 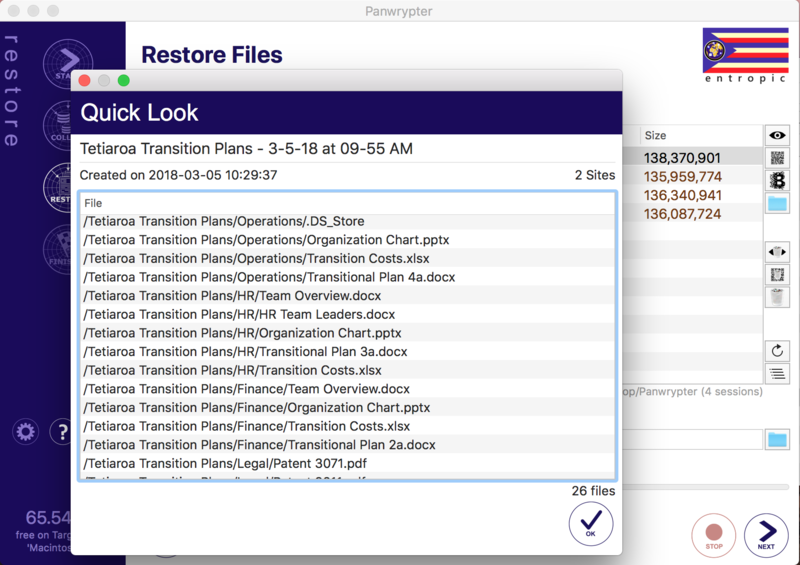 You typically print this onto paper, after you have protected your files, and store it in a safe place that is independent from your storage sites. 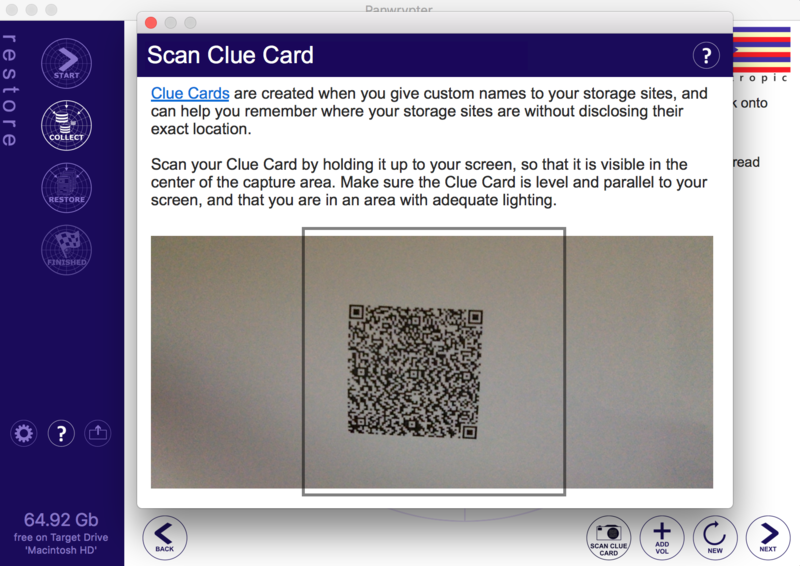 Selecting the "Scan Clue Card" camera button will allow you to scan your Clue Card. Refer to the instructions on the "Scan Clue Card" dialog for how to correctly scan your clue card. More information on Panwrypter Clue Cards. If your Clue Card was scanned successfully, the "Scan Clue Card" dialog will close, and you will see the session name and the site clues for each site in your protected session displayed. From here, you can proceed with collecting protected volumes from each of your storage sites. In order to collect your protected volumes back onto your Mac, you'll need to have your storage media plugged into your Mac, and/or your online storage services configured and accessible in Finder. If you have stored your protected volumes on removable media such as a removable USB hard drive, or flash media such as a USB thumb drive, insert/connect the first/next removable media, then select Ok. If you have stored your protected volumes on one or more online file storage services, such as iCloud Drive, Google Drive, or DropBox, make sure you have configured the storage service correctly, including installing any required software, then select the relevant folder from the Sidebar in Finder. If you have stored your protected volumes on physical storage media, such as DVD/Blu-Ray, insert the first/next disc into your optical drive, then select Ok. Select the "Add Volume" (+) button to start collecting volumes. You will be prompted for the first/next Finder folder location to collect from, until you have collected all of your volumes. Select the folder which contains the protected volumes (ending in .wrypt) that you want to collect. 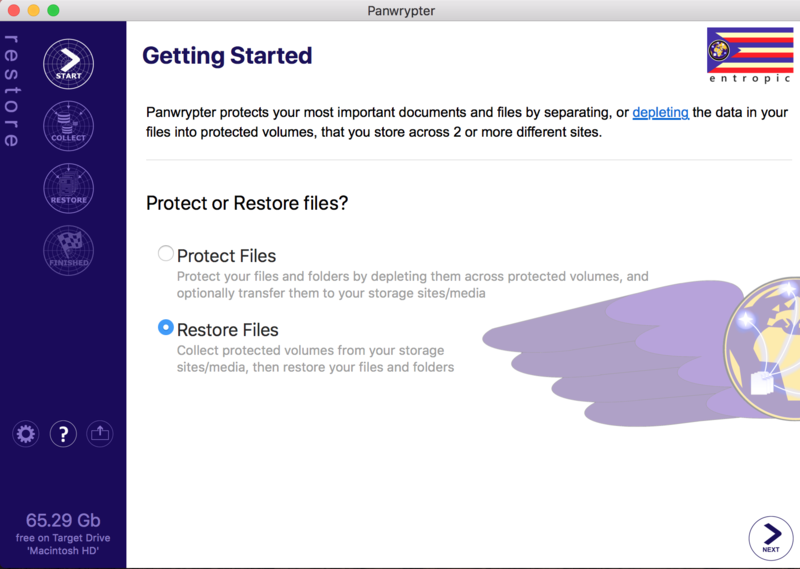 Selecting a folder will tell Panwrypter to automatically check that folder for protected volumes, along with all subfolders that are below it, up to a depth of 5 subfolders. Once you select the folder, the collection of your protected volumes will commence, with the Collect screen being updated accordingly with the progress. Repeat this process as needed, to collect the remaining protected volumes from their storage sites. When you have finished collecting all your protected volumes from their storage sites, you will receive a notification. 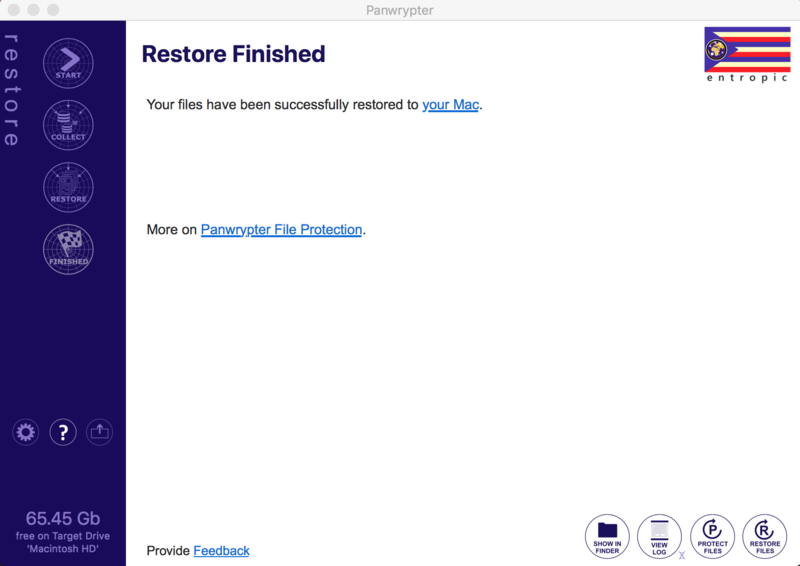 You will then be forwarded to the "Restore" screen, which will allow you to commence restoring your original protected files. This screen lists all of the available protected sessions that exist on your Mac in your Temporary Sessions Folder. New protected sessions are added here when you either protect files, or when you collect volumes back from their storage sites in preparation for a restore. Using the buttons to the right of the list, or the right click context menu, you can manage and restore these protected sessions. IMPORTANT: For security purposes, and since this area is only for temporary storage, each protected session listed here should be erased, once you have either transferred it to it's designated storage sites, or when you have restored your files. The protected sessions listed here will change color over time to indicate that they have been on your Mac for too long, and should probably be erased. Use the "Secure Erase" feature to remove protected sessions that you no longer need. Double click any session, select "Quick Look" from the right click menu, or select the "Quick Look" button on the right side, to view it's file contents. Note: In some cases, you may not be able to view the files in a protected session, as there is no Session Manifest. This is normal, and is because the creator of the protected session did not want the list of files and folders in the session to be viewed. The Clue Card is optionally created if you provided site clues when you protected your files. Select "View/Print Clue Card" from the right click menu, or select the "View/Print Clue Card" button on the right side, to view the Clue Card for the selected protected session. Note: If no Clue Card exists for a given session, it's either because the session has been collected back from it's storage sites, or no site clues were provided when the files were originally protected. Generally, the Clue Card will only exist for protected sessions that have been created, and left on your Mac, since it is not transferred to, or collected back from your storage sites. 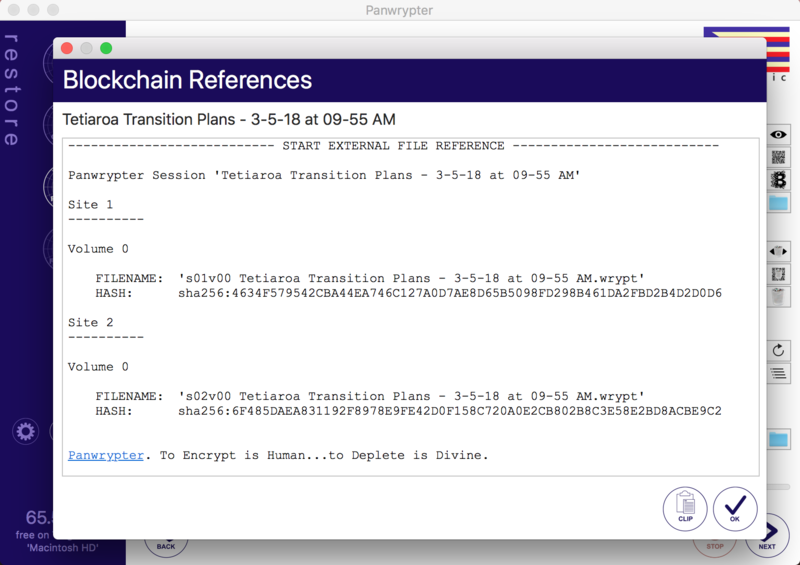 Select "Create Blockchain References" from the right click menu, or select the "Create Blockchain References" button on the right side, to view the blockchain references for the selected session. Use the "Copy to Clipboard" button in the bottom right, to copy the Blockchain references onto the clipboard. This option is provided if you need to create references to your protected volumes as assets for storage as part of a smart contract in the Blockchain. These references allow the protected volumes to be authenticated at a later time, prior to restore. Additionally, you may also want to add additional information to these references, such as storage site location, clues, and media type. If the Protected Session you want to restore has any physical restore restrictions in place, you'll want to make sure you are in an authorized physical location from which this session is allowed to be restored. Select the protected session that you want to restore, and select the "Next" button. Enter the password, and select "Ok". The restore of your protected files will commence. If the protected session was created with the create recovery files option, an initial integrity check on the files is performed at the beginning of the restore. If any site volumes are found to be damaged or corrupted, Panwrypter will attempt to automatically recover the files. If this happens, you will see messages to that effect during the restore process. If the protected session was created with any physical restore restrictions in place, your current physical location will be used to determine if you are authorized to restore from this location. You may need to enable location services so that this check may take place. If you are in the wrong physical location to perform a restore of a protected session with physical restore restrictions, you will receive a message, and the restore will not proceed. To correct this issue, move to one of the physical locations that was authorized when the session was first created. If the protected session was created by someone else, consult the original creator of the session to find out where it may be restored from. If you are having problems restoring a protected session that you know is authorized for your current physical location, select the "Need Help?" button that appears when the restore is denied. The "Location Services Troubleshooting" dialog will be displayed, which will run through a few simple checks to help diagnose the issues you may be experiencing. For additional information, refer to Troubleshooting Location Services Issues when Restoring Your Files. If there are any important messages related to the restore, a red exclamation button will appear. Select this button to display a list of the issues that occurred during the restore process. A recommendation may also be provided to show you how to resolve the problem. IMPORTANT: Please thoroughly review any messages to ensure that you are aware of any problems that may have occurred. The "Restore Finished" screen will be shown once the restore has finished. From here, select the "Open In Finder" folder icon, to open the files in Finder.